The best time to visit Canaima National Park and Angel Falls is during the rainy season, from May to November. Catching the beauty of the region and the falls can be done by plane at any time of the year. However, keep in mind that during the rainy season, clouds often cover the falls, and the dry season finds the falls disappearing to simply a trickle or mist. Flights are available from any major Canadian airport to Caracas, Venezuela, with usually one or two stopovers. From here, catch an overnight nine-hour bus to Ciudad Bolívar with a bus company like Rodovias (rodovias.com.ve). Buses run from 7:30 a.m. to 8 p.m. and the trip costs approximately $32 to $36. Once you reach Ciudad Bolívar, catch a small plane to Canaima, usually around $123 a person for a return trip. From here, meet up with your tour group for the boat ride along the Carrao River to Angel Falls. The author toured the falls with Excursiones Kavac, an indigenous tour group (0414-884-0511). It is also possible to take a plane from Caracas directly to Canaima, although it’ll cost you more. Avior Airlines (avior. com.ve) is the only airline with a direct flight from Caracas and costs $370 return. Flights depart at 9 a.m., arriving at 10:30 a.m. Flight return to Caracas at 12 p.m. to arrive at 1:30 p.m. Everywhere within Canaima National Park, you’ll be surrounded by the tepuis, flat-topped mountains that are estimated to be 180 million years old and are home to cascading waterfalls, often created by the accumulation of 2,000 to 4,000 millimetres of rain per year. 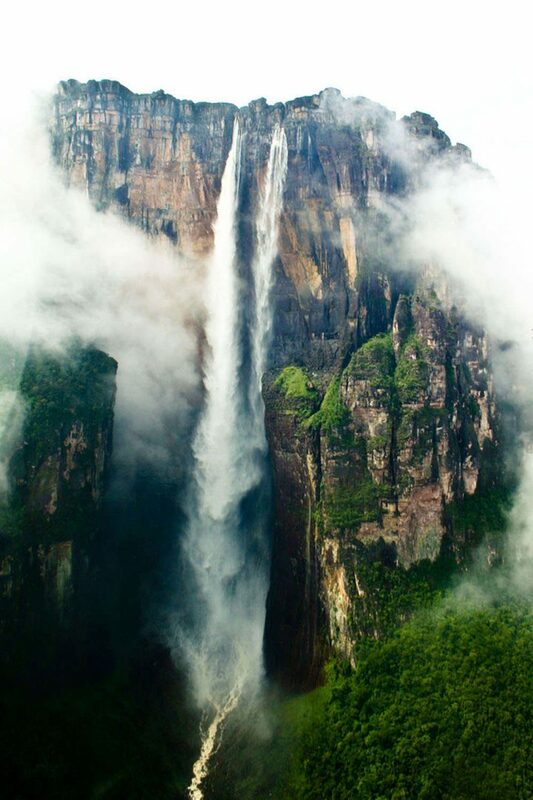 Angel Falls, the highest in the world, drops 979 metres off the cliffs of Auyantepui—the park’s largest tepui (but not highest). Canaima lagoon serves as a base camp for visiting Angel Falls as well as Sapo Falls. After crossing the falls, you can walk to a second waterfall, Sapito Falls. The most impressive thing about Sapito is the deep red colour of its water. The presence of quartz gives the water its distinct colour, and on Canaima Lagoon Beach, gives the sand a pink hue. On the opposite side of Canaima National Park is Roraima, the tallest tepui, with its highest point at 2,810 metres at Maverick Rock. Located on the border of Venezuela, Brazil and Guyana, it boasts challenging trails and interesting rock formations at the summit. It’s approximately a 12-hour climb. Most hikers need four days for a return trip. Starting in Santa Elena or San Francisco de Yurani, make your way by bus to Paraitepui, a small village at the base of Roraima. It’s a two-hour bus ride from Santa Elena or 22 kilometres East of San Francisco De Yurani. Note that no one is allowed to enter Roraima after 2 p.m. to give climbers time to get to the first campsite, a five-hour trek away. Arrange for a guide in Santa Elena if you’re not part of a tour group. The majesty of the water, mountains and falls of the Canaima region will surely leave any visitor pausing to catch their breath.